Everything (animations, textures, sound, static) are working except for skeletal meshes. Might need a tweak in Umodel. Here are some test skeletal meshes in .uasset with the issue. Thanks and if you need any other files just let me know. Typical user's mistake here is when only one UE4 version is being checked, and not tried any other version. I'd suggest you to try all versions which umodel will supply in "unreal engine 4 version" dialog window. May be you already tried, I don't know - you didn't tell anything except "it crashes with 4.13". Yes I have already run through all the engine versions to check,the animations / static/ etc.... work with v4.13 however the skeletal meshes don’t seem to open with any version. Just an update- I have tried absolutely all combinations to get the Skeletal Meshes exporting - no version of unreal engine currently works with them. It definitely needs a look at and to make a change in Umodel to support it. Would love support for this as i have the paks unpacked but cant open uasset. Any update on skeleton mesh support for this game? If there would be updates, they'd be in this thread. No messages here - no updates. Well, I've take a look at provided files. Added a quick fix to let those 2 skeletal meshes to load. -game=sod2 or overriding to "State of Decay 2" is required. 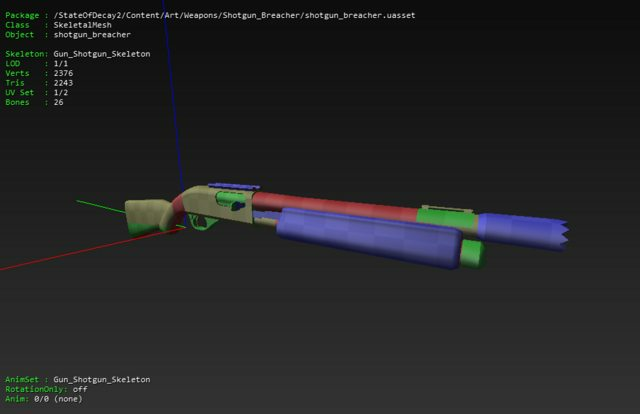 As I said, I have only 2 sample meshes, so I can not guarantee that UModel will not crash with anything else. The game requires intense testing. Skeletal meshes work great, have had no crashes related to them yet. Thanks. Yeah everything works fine, only minor issues is most models have no textures viewing in uModel, due to some custom material setup I believe, nothing major, textures are in same folder has mesh. Out of curiosity, What version of the game are you using? I bought it through the Microsoft store and it looks like the files are encrypted and no amount of permission settings will let me access the Paks. This is usual situation with Microsoft's games. I think it has standard solution, check Gears of War 4 and Sea of Thieves threads. 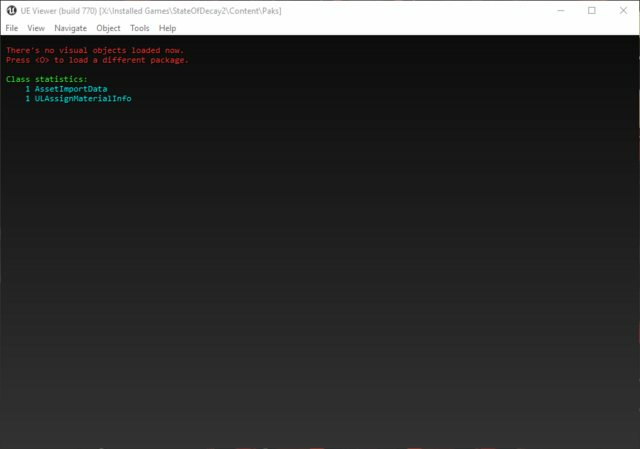 Got it from the store also with Windows Game Pass, you need to use this UWPDumper to decrypt the files, same has Sea of Thieves in the other thread has Gildor mention..
Do I have to compile UWPDumper from Github? I can't find an exe file.